Racing consists of both High speed and Endurance test for the tyres to be put to the toughest of conditions, be it heat and traction to the tyres. 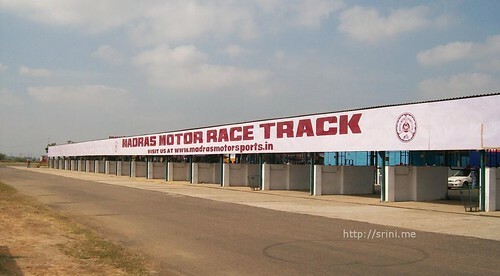 A race track has straight stretches which witnesses a top speed of around 150 kmph and the sharp turns which invite abrupt braking. 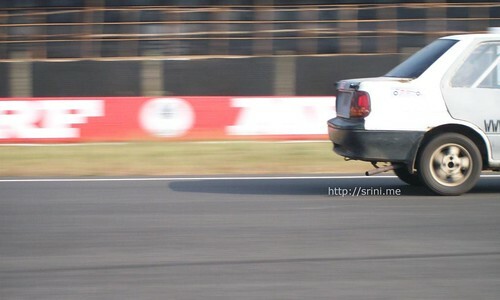 So far, I happened to get myself glued on viewing those speeding race cars on the TV channels. But, hearing those loud tappets thumping alive out of these powerful race engines at just 10 feet away is really a thrill. 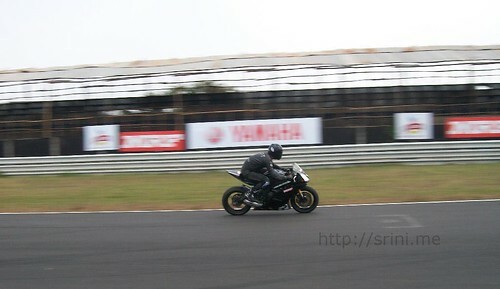 Apart from the Formula 1600 cars, there were modified cars and three different kinds of bikes taking part in this race. 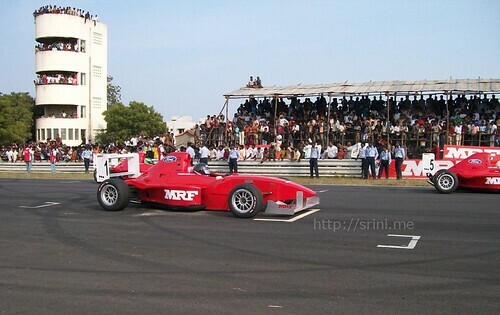 This racing event which happened at the Madras Motor Sports Club's Race Track at Irungaatukottai was wholly organized by my organization MRF. It gave me enough fodder in terms of high speed cars for my hunger to do something anew in my favourite of the hobbies called photography. So far, my camera witnessed catching interesting moments of few geeky events, travelogues, portraitures, photo walks involving street photography and musings at home. But catching a moving race car had not been my fodder yet. 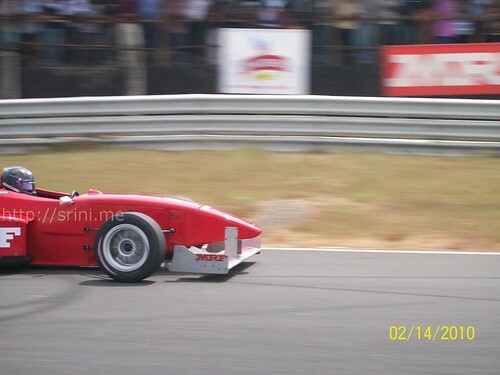 There is a technique called panning which involves moving the camera along with the high speed race vehicle and simultaneously clicking it. If done right, the fast moving car appears frozen and the background appears streaked. If done wrongly, everything in the photo appears frozen which kills the racing effect in the picture. 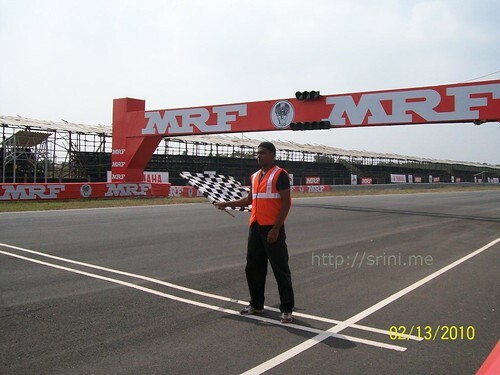 Though a race track is a lab for the tyres to get through the acid test, this "MRF International Racing Challenge 2010" was a classroom for me to learn this photography technique. 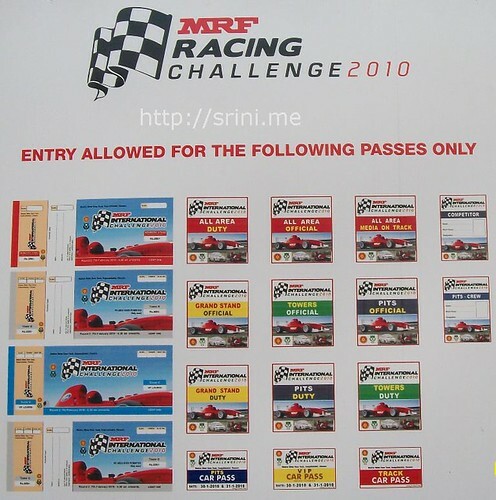 As an employee of MRF Tyres, I got few gallery tickets for the Sunday(14-Feb'10) event. If I was sitting in a gallery and viewing this race, I would not have been able to quench my thirst for photography. Luck kicked me through Sundar Sir, who informed me that there were some race events and qualification rounds scheduled for Saturday. 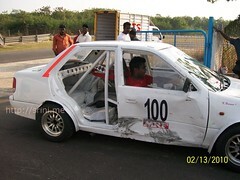 I started from Cuddalore at 4.00 a.m. on Saturday and reached the race track at about 10.00 a.m. 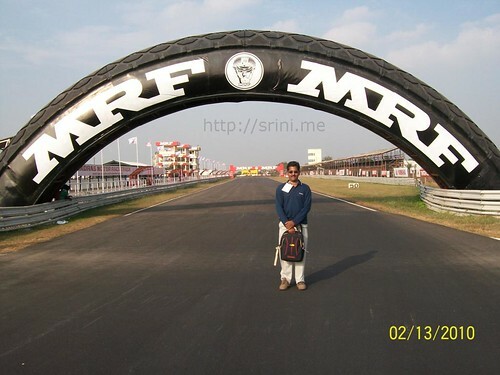 This is the entrance to the race track premises, going further straight inside leads to the pit and the tower. Getting to your left leads to the gallery. There are different types of passes which allows entry to specific zones inside the race track. I have only the gallery pass, that too for the next day. So, I was stopped midway and not allowed to go near to Pit and race track. While entering, Sundar Sir noticed me standing out side, he had invited and taken me straight to the pit. 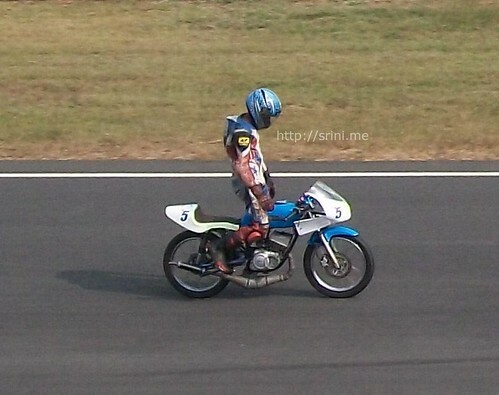 While entering the racing stand, bike race (600 CC category) was going on. First time in my life, I happened to hear the loudest decibels of the race bikes at close quarters. I stood near the fence and clicked a few pics. So far, I am not that much a fan of Ajith. Though I am not a movie buff, his films Aasai and Vaali had made enough of unforgettable memory in me due to his apt performance. Clicking this pic I could see enough of charm, he has in his psyche. Though watching this sport gives lots of thumps on your adrenaline, there are risks involved in it. Alas the more the risk, the popular it is. Myself got to witness a race driver getting injured after he got thrown away from his vehicle cruising a bend. 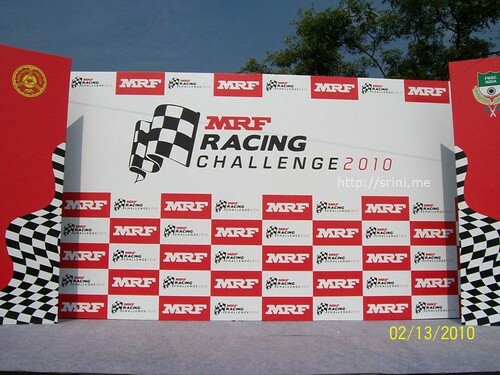 The podium waiting to garner the winning race driver. This bike is the Soft Bones category and are the slowest ones on the race track. Somewhat it was boring. 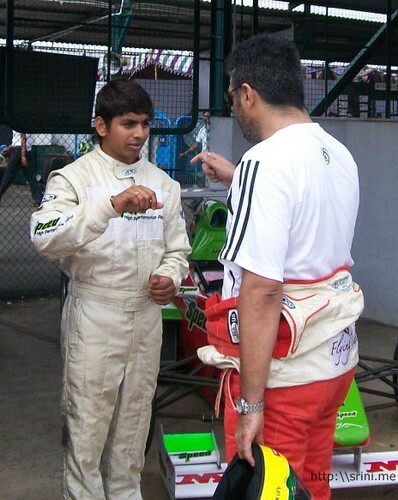 That is Formula 1600 whiz kid Ashwin Sundar aged just 19 and a nice person to have a pep talk. 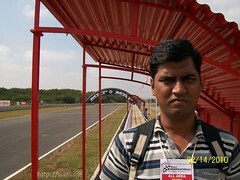 Sundar is one of the top Formula racing driver. 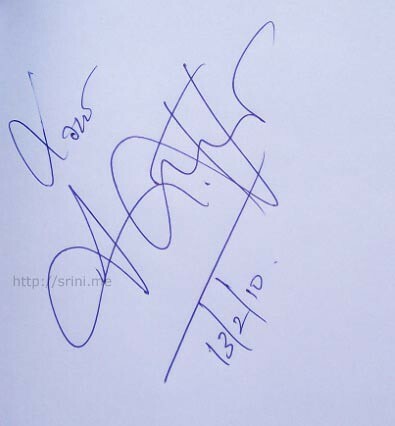 That is Actor Ajith's autograph. Standing on this podium gave me some sense of satisfaction, just freezed those moments. I requested Sundar sir to stand in front of podium. Formula 1600 cars getting ready for the qualifying round. 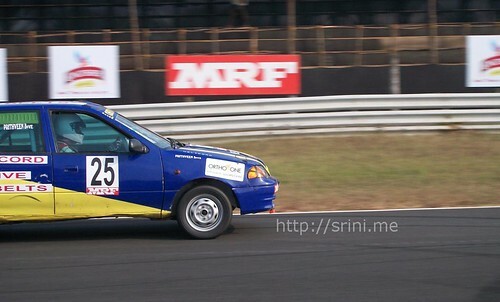 For the race drivers, the competition exists only on the Track while they drive their vehicles. There is a strong gentleness and bonding while they are off the road. Seen here is Ajith having some moments with Ashwin. Yup, Ajit has got a macho style in his walk. I enjoyed his presence there. I too got to become a fan of Ajith from now on. Somewhat lucky to get this panned photo. 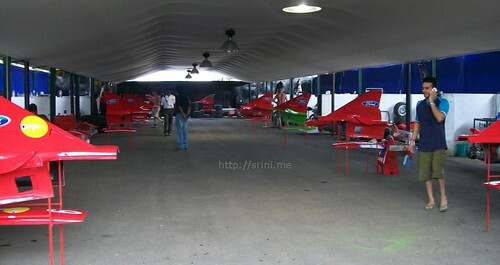 The race cars getting ready in this area called "Pit area". 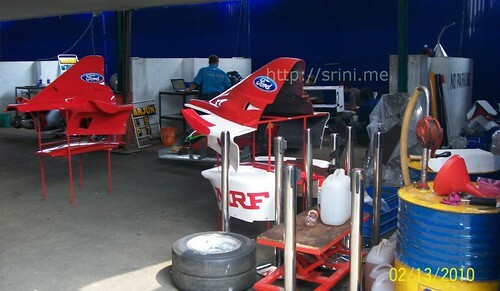 There were some 50 people working hard to get those 10 Formula Cars ready for the racing events. 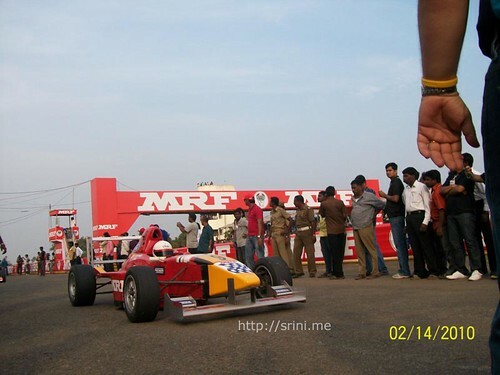 That is India's First Formula 1 Driver Narain Karthikeyan mentoring the upcoming Formula 3 driver Ashwin Sundar. Both are very gentle men to move around. Padma shri Narain Karthigeyan surrounded by college girls……. 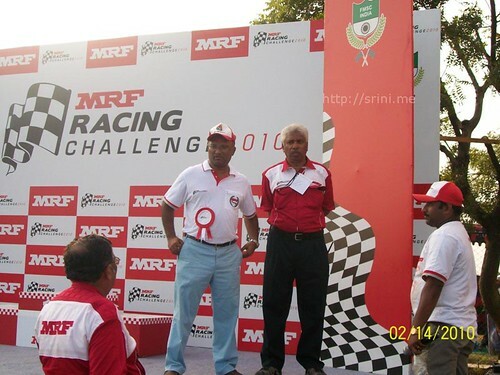 Mr.Isaac Prabakhar of MRF with his family members with Narain Karthigeyan. 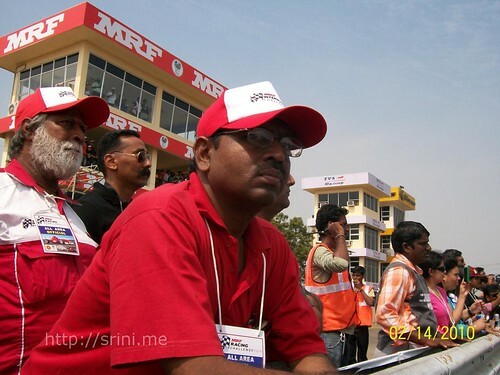 Thats Mr. John Williams of MRF with his daughterwith ace driver Mr.Aswin Sundar. 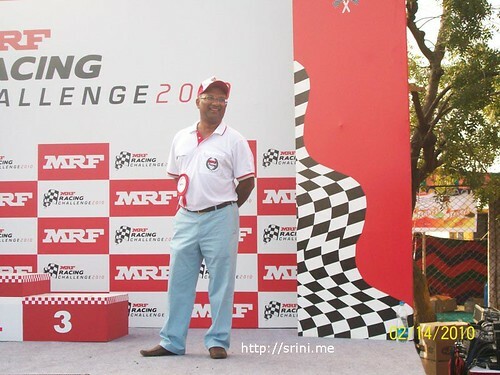 Mr.Soman Jospeh of MRF, Manager Advertising is in action. Vehicle cannot escape from his sight. A winner relishing his winning moments. 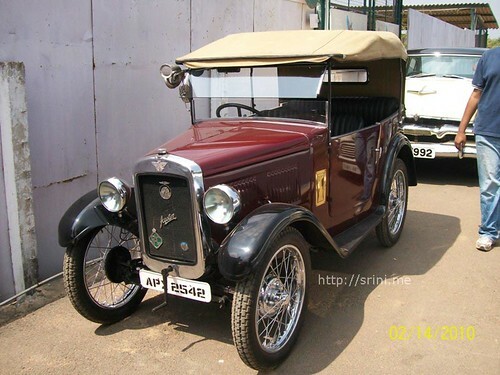 'Super salon' type of cars giving the adrenaline gush. 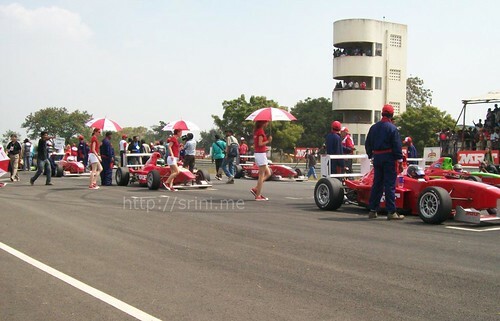 Formula 1600 cars, super salon cars(Esteem), 600CC bikes, modified 100CC bikes and soft bones category of bikes are the different type of vehicles which took part in this event. These vehicles travel at different speeds and it was at first a challenge for me to get used up with these race vehicles. My camera has moved little faster than this car. Here I have moved my camera a bit slower than the car. That is a TV crew catching up with the drivers after the race was over. 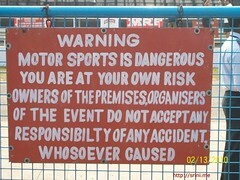 Racing has its own risks. In this case, the driver is lucky that he had lost only the door of his car and not his limbs. This arch gets the logo of the organisers. 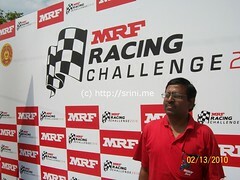 That is, our MRF is the organiser and it carries the logo. 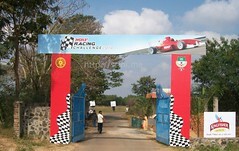 This arch at the Madras Motor Sports Club was originally conceived and installed by MRF way back in 1986. 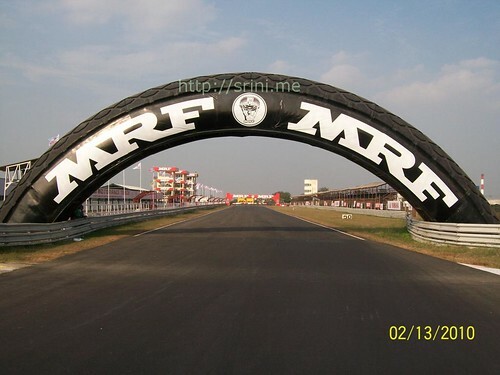 The design of this arch is based on the popular Nylo Grip tyres (two wheeler) of our MRF. 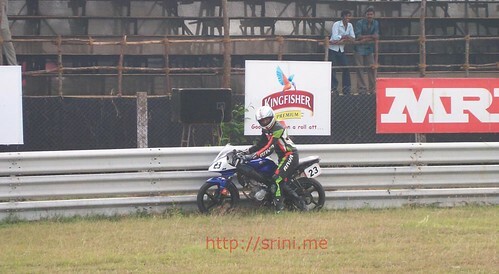 It was off-race time slot and myself got the luck to peep into the race track and get this click. Its years that I got to see this arch with MRF logo in photographs, various movies and in various visuals at my organisation, but this day I managed to freeze this arch with myself in the frame, really a cloud 9 moment for me. Closer look. No. No. 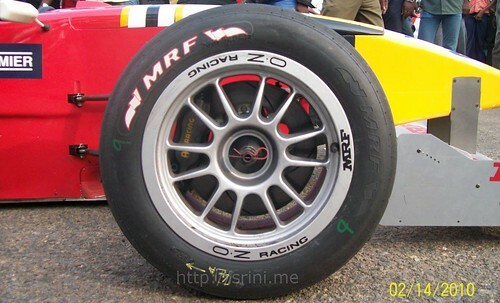 Giant look of the MRF Nylogrip tyre pattern. This is the second day at the race track. He is my brother. 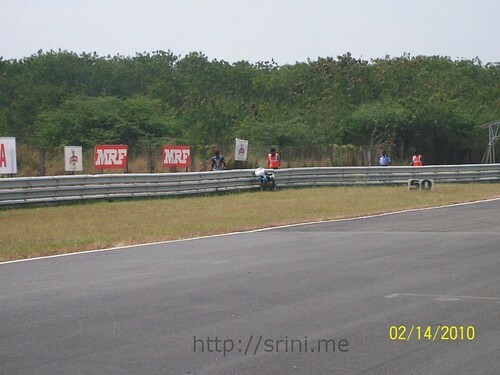 He got mesmerized to get a glimpse of the racing machines from such a close quarter. Its always not that all men succeed with their machines. His machine failed midway. 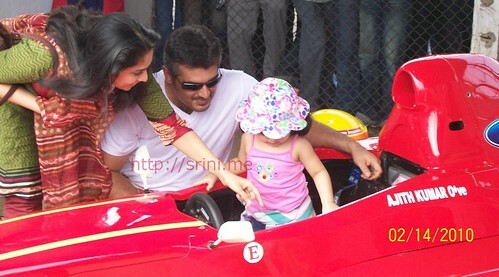 This is during the second day that Ajit came with his wife Shalini and their cute little daughter Anushka; making their way into the race track. The cute little Anushka gave a nice moment for my camera. What a charming face !! Hope that Anushka be the first female formula driver for team India in the years to come. 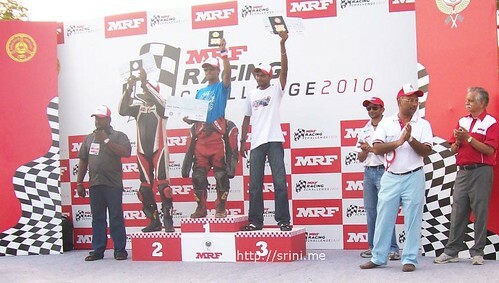 Mr.Murali seen with Actor Ajith and Shalini. 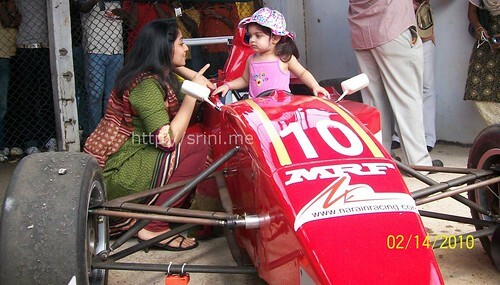 Hey Anushka, this is Dad's toy not yours, Shalini seems to tell her kid. 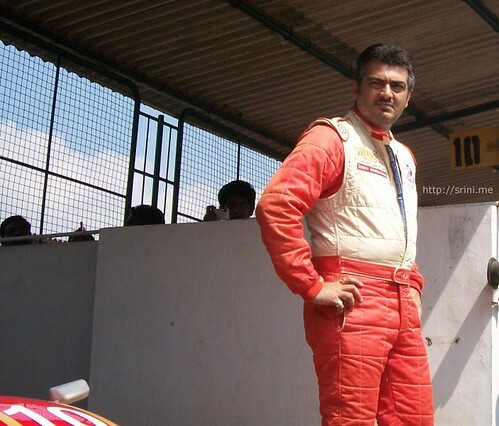 Thala, getting set to go. 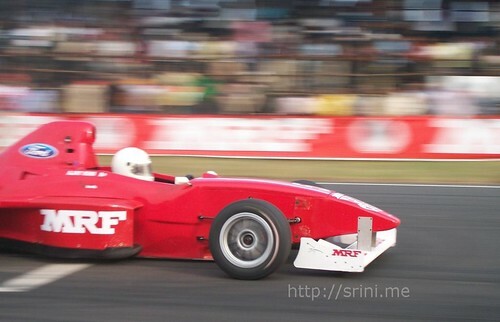 Seems that expert inputs getting inculcated to this Formula Car driver. The race is to start. Cheer girls coming in to the track to protect the Formula drivers from the hot sun ( >:( Is it required!! as they already wear an helmet to take care of them?). Still these cheer girls are equally the crowd pullers like the formula cars. Got a successful panned shot, but my camera has travelled a little faster than the car. 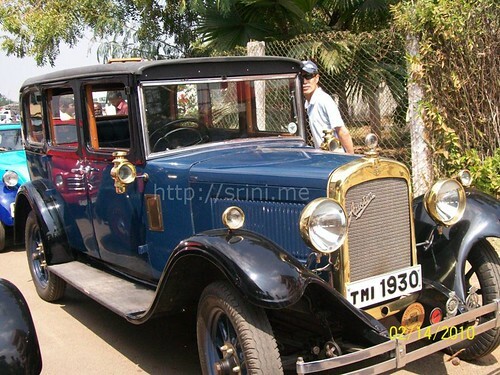 The vintage cars gave some soothing moments on that hot day. A cat walk by the Vintage cars. Hope the owners are very rich people strong enough to spend on maintaining these golden chicks. During the lunch break, there were some dance and song programme. Having clicked the high speed vehicles, freezing these dancers on the air had got to be a child's play for me. Ready for the flag off. 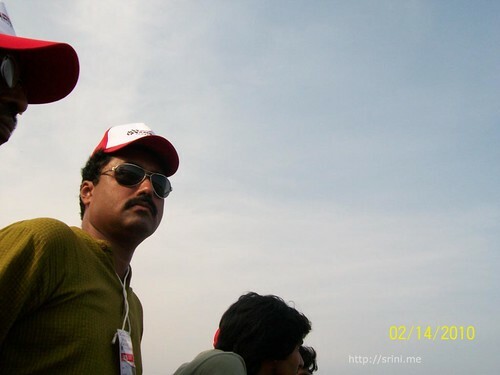 That is Sundar sir and Simon sir. A candid shot of Simon sir. The awesome high speed chicks making the thunders. Once these chicks went past the starting line, I got to smell the long awaited perfume of the burnt rubber. There were 10 laps and I started to catch as much panned shots as possible. Below are some of the wonderful panned shots which I finally succeeded to make out of this event. This above pic is one of the nicest panned shot I ever got. 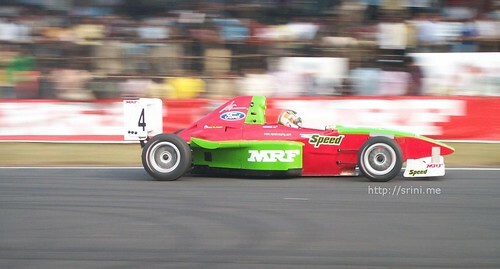 You can see the clear MRF logo on the car and the much distorted MRF logo in the background. Alas this photographer has somewhat added a nicest feather in his cap. Hey, "Have you done that panning technique?" 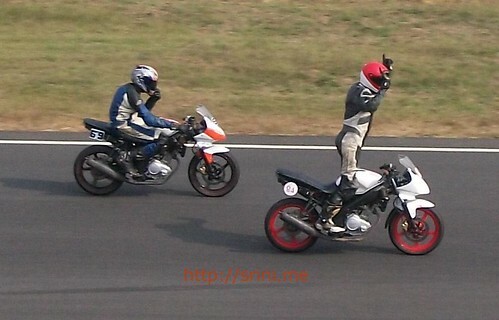 Come on lets go together for the next racing event. This is a simple technique that could be achieved even with the simplest of the digital cameras. Thanks to friends of Chennai Photography Club whose inputs got me interested in photography. On the first day of the event, I actually got shrugged off from trying the panning shots. I had crossed some 500 shots, but could not find out how the panned frame was successfully achieved. I somewhat left the pit area and was planning to leave the track premises. After that, I had a short telephonic talk with Rupya Ganesh who motivated me with the simplest of the things to be done while doing the panning. Hi Rupya Ganesh thank you very much, a bit of your motivation laid in me a strong confidence to do the shots. I once again had gone inside the pit area and continued my shooting. Alas, I have got a video for you to know first hand how panning shots are taken by photographers. Of course, the success of a motor race depends on the 4 bests. i.e. Tyres, Car Tuners, Machines (Cars) and the Drivers. And all four should equally match. The making of a race tyre involves a lot of permutations. 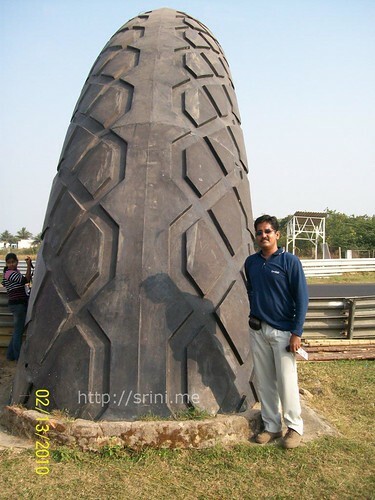 Making of these formidable tyres does carry with it a lot of research, design, development, follow-ups, trial & errors, sleepless nights by my colleagues and a lot more things. 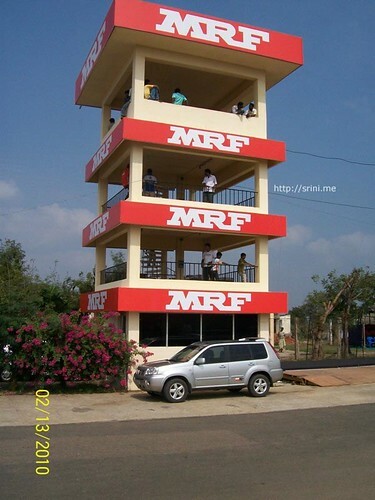 Finally a bright and superior brand called MRF. Usually, tires when subjected to a multiple number of races do get to fail. In the Sports channels, I have noticed some of the tyres getting burnt, but I have not witnessed any such incident here. Of course right permutations have gone in designing these tyres. 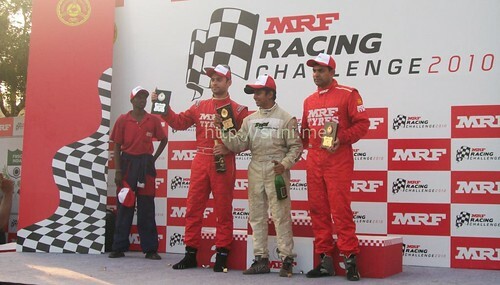 The enduring tyres did their very best without any failures for the multiple races and won the laurels of India's first Formula driver Narain Karthikeyan. Of course the tyres we race are the tyres you buy!! 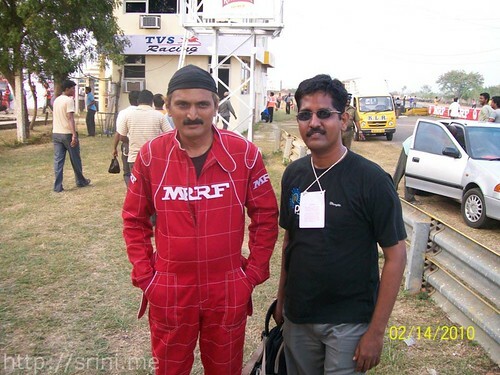 Myself got clicked with one of the MRF Race driver. You may notice me with a darkened complexity. 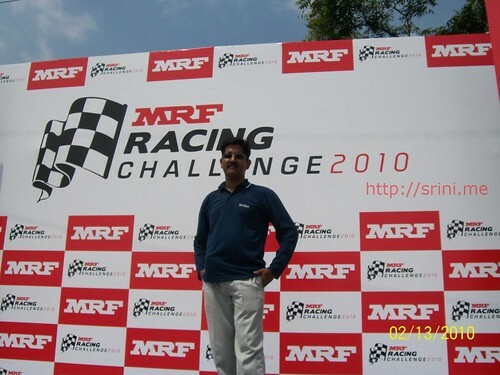 Out of awestruck moments at the race track, I was roaming all around on both Saturday and Sunday under the Sun and had skipped lunch with managing an ice cream a day and few bananas. So the effect of the sun on my skin made me darker. Back at home, the effect of the heat drew me damn tired and it took 6 days for me to retain back to my normal health. Caution: If you are in similar situation, please try to avoid direct sunlight. But if you want to catch nice photos, its not the right decision to stand in under a shadow. So wear a cap. Do not skip your lunch. 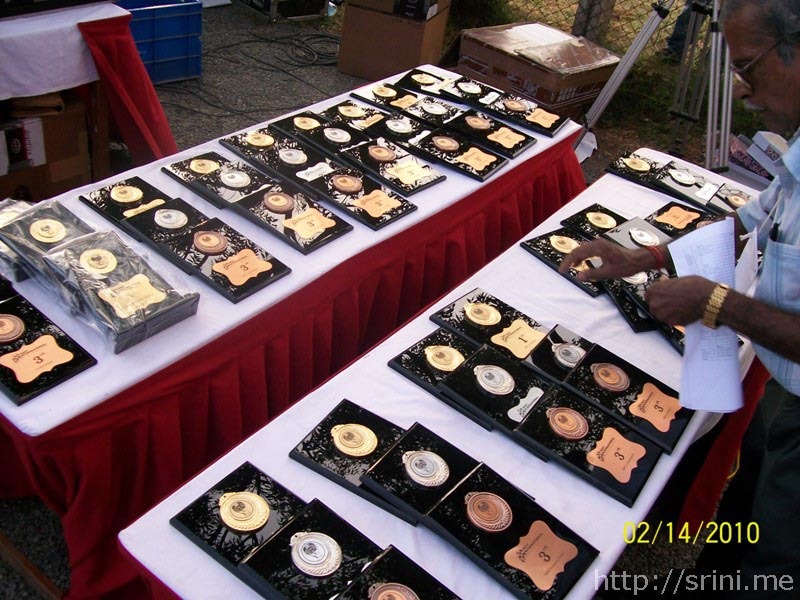 The momentos awaiting to be garnered to the winners. 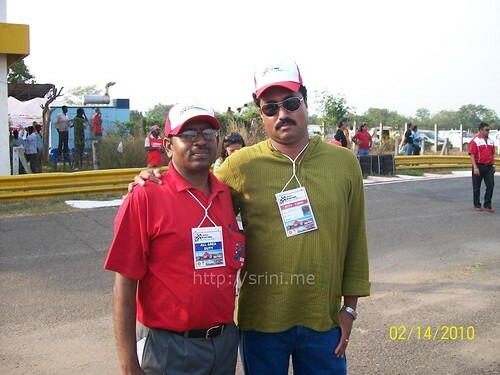 Our MRF's Managing Director Mr.Arun Mammen and Advertising head Mr.Antony Rodricks. Finally the orgasmic moments for these toughest of the drivers who made the WIN. 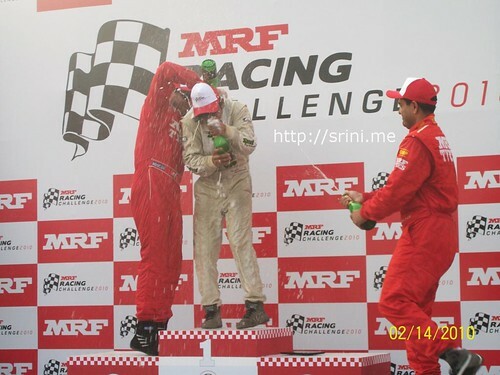 Seen here are INRC Champion 2010 & MRF talent driver Gurav Gill and MRF veteran driver Arjun Balu along with MRF Racing Champion Aswin Sundar; enjoying the winning moments. Some more videos for you to cherish. The modified bikes making out the fights. If not for Sundar Sir, I would have been sitting in the gallery. I would not have got the chance to catch all these photographs; you would not have got the feast of these pictures and videos in this blog. Plus few pictures I got from Sundar Sir. keep us informed about the upcoming racing events..
Good effort. Nice to see your article. keep up the good work. I shall update of forthcoming race events at this blog. It was an excellent write up with some very good photographs. I could see all your hard work and enthusiasm. Thala fans would have been the most happiest ones on viewing this blog. Keep up your good work.